To configure Video and Photo Settings, click Tools >> Application Settings >> Video and Photo. 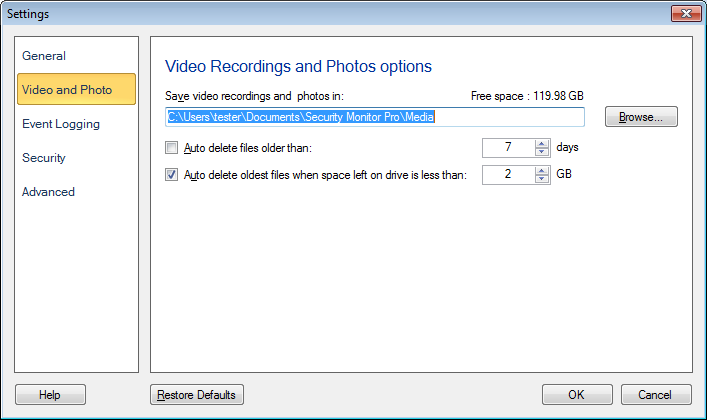 Save photos and video recordings in: By default, all media files such as video recordings and photos will be saved on your PC in Documents >> Security Monitor Pro >> Media. You have the option to change the default folder by clicking on Browse. Auto delete files older than n days: This method is a good choice if you know that an important file will be looked at (and copied to a new location) within a set time after it is recorded. Auto delete oldest files if n GB left on drive: In order to avoid completely filling up a hard drive, you can choose to delete the oldest file whenever Security Monitor Pro is launched, and only the set amount of free space is available. Note: Security Monitor Pro checks for auto deleting such files at launch, when settings dialog is closed and Auto delete options are checked, and for every 6 hours, if it is running for 24 hours or more.